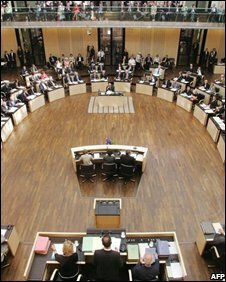 Germany has completed ratification of the European Union's reform treaty. The document easily won the necessary two-thirds majority in the upper house, which represents the country's 16 federal state governments. The lower house overwhelmingly backed the pact, known as the Lisbon Treaty, last month. The treaty must be ratified by all 27 member states to take effect. Only one country, Ireland, is holding a referendum on the issue, next month. More than half of the 27 members have now passed the agreement into law. The treaty is aimed at simplifying the EU's unwieldy decision-making processes and will establish a major new foreign policy role. It replaces the more ambitious European constitution that was rejected by French and Dutch voters in referendums in 2005.